WFIL- AM 56 enjoyed its heyday from 1966 to 1976. You can relive those days with sound clips, jingles, and photos by clicking on the bumper sticker above to go to Famous 56.com, brought to you by "Big Ron" O'Brien! Click the sticker to go to a tribute to "The Geator," Jerry Blavat. Geator Gold Radio is now defunct, and Jerry's current radio home is WPEN 950-AM. Sadly, Dr. Don passed away in Mar. 2005, and his website no longer exists. A tribute to Dr. Don is forthcoming on the Philly Bits & Bio's page. Although Dr. Don's time in Philly was relatively brief, he went on to achieve great fame in San Francisco and was one of my personal favorites. Check out this fun flashback from former Philadelphian Eddie Ciletti ! Remember Gino's? Click here for a great tribute! 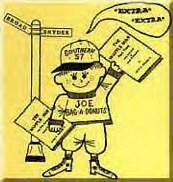 Click the picture of "Joe Bag-a-Donuts" to see more great Philly nostalgia at dwaffleman .com! I'll never forget when I was eight years old and I got my first radio. It was 1974, and AM radio was still in its heyday. It was a real adventure surfing that dial, discovering all the Philly stations and formats that I never knew existed (my dad only listened to KYW newsradio in the car, the only radio I had been exposed to). What really blew my mind was surfing at night and picking up distant signals like WBZ in Boston, WABC/WNBC/WCBS in New York, KMOX in St. Louis, WLS in Chicago, and "3WE" in Cleveland. It was like I discovered a whole new universe! Pretty soon after that I got my first tape recorder, and I went crazy trying to tape every song, DJ, and station ID there was, not to mention my sisters and I making up our own crazy productions. Well, most of those tapes disappeared over the years, but there are a few I've managed to preserve, from those early "low-tech" tapes made by holding the single built-in radio speaker up to the tape recorder mic, up through my years in college radio in the mid-80's. (Note): As of 4/30/02, Tripod has greatly limited the amount of space available for website publishing, which has reduced my ability to provide sound clips and images. I will try to swap them every so often since I can not include them all at one time. All photos, images, and sounds are property of their respective owners.